NTREIS Matrix is the primary MLS system and includes both search and input functions. The CMA generated report from NTREIS MATRIX provides an average Sold Price per Square foot, Percentage of the Sold Price vs. Listed Price for selected sold properties, and average Listed Price per Square foot for selected Active/Active Option/Cancelled/Expired and Pending properties. See Figure 1 for more information. Currently, the Matrix adds all numbers under each column in a group (e.g., Active Status) and divides that by the number of items in the group. This calculation is correct for all columns except columns for $/SqFt and SP%LP. 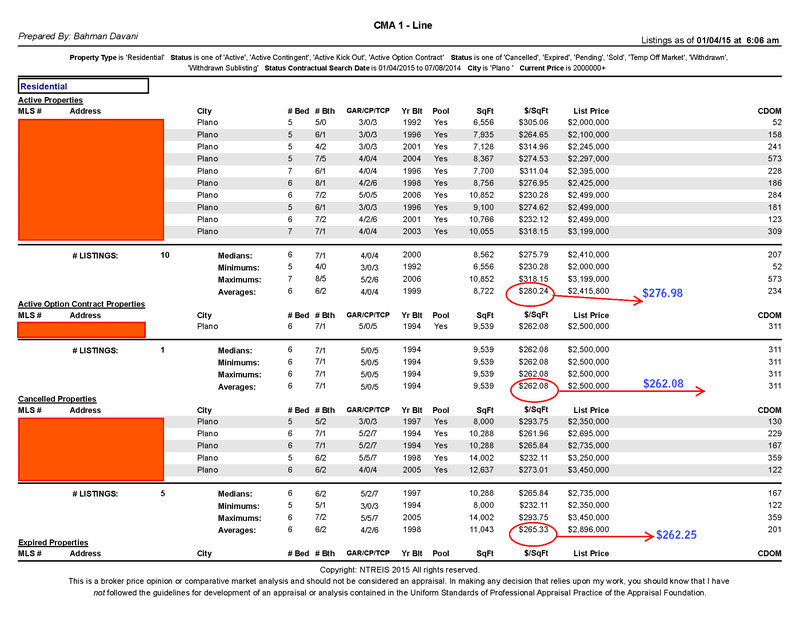 In the example shown below, this results in Avg $/ SqFt =$280.24 which is WRONG and should be $276.98. All incorrect numbers are circled red and their respective correct number shown with blue color. Question: One may ask how the calculation is correct for other columns except $/SqFt and SP%SL. Answer: The answer is because all other columns are independent of each other, where as Average Price per Sq Ft ($/SqFt) is dependent on the Listed or Sold Price AND Sq. Ft. of each property and therefore calculated based on these two numbers. One cannot assign an arbitrary numbers for these two columns, they are calculated. Solution: The correct way is to add all numbers under each column of List Price (or Sold Price) and divide that by total numbers added in column SqFt in a group to derive the correct averages for $/SqFt and SP%LP. This also can be achieved by simply by dividing the calculated Average for List Price (or Sold Price) and calculated Average SqFt. Note the 1 Cent difference is due to round off (the actual Average of SqFt is 8721.5 but used as whole integer 8722). I caution each agent in North Texas to be aware of these inaccuracies. I have reported these to NTREIS Matrix Committee too, hope to be fixed. To show my points and better understand the problem, please see the following scenario for illustration purposes only. A Computer store sells 100 computers at $100,000 and 1 refurbished computer at $100. What is the Average sell price per computer? 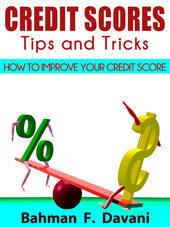 This Incorrect way, is the way Matrix CMA calculates Average $/Sq.Ft. are calculated based on two numbers (List Price)/SqFt. 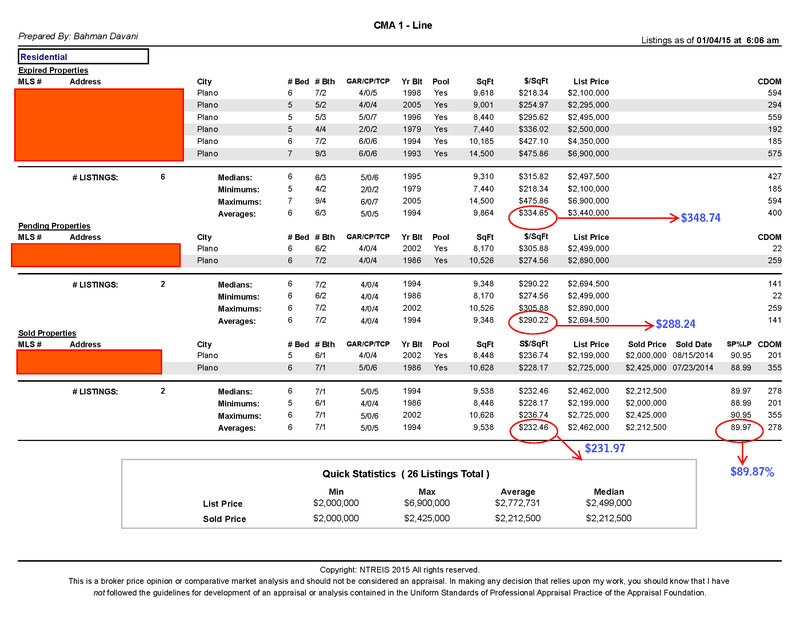 This wrong Averages calculation in Matrix CMA, results in a $32,500 higher for a Buyer with a house around 10,000 SqFt.